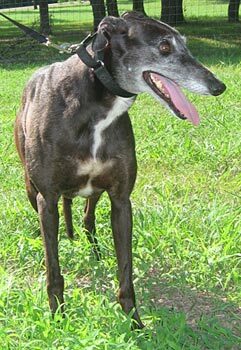 Twila, aka Killin Time, is a beautiful, 6½-year-old female born March 5, 2002. 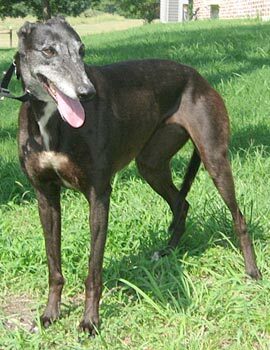 Her sire is WW Time Warp and her dam is Intel Inside, making her grand-sire Wigwam Wag. She, along with Casper, was found as a stray and taken to the Amarillo Humane Society. There are no races to Twila's credit on Greyhound-data.com, so her past history is totally unknown. 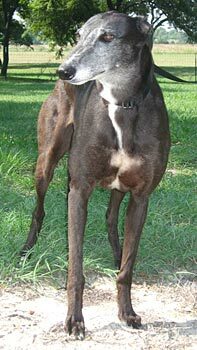 When she arrived, Twila ws positive to Ehrlichia and Babesia. She has been under the care of Dr. Jeff Ellis and Dr. Christy Soileau of VCA Preston Park Animal Hospital. Her 8 week treatment has been successfully completed, and Twila is ready to find her forever home! Twila and the cats: Twila should never be trusted with cats. She moved in for the muzzled "bite" immediately upon seeing the cat. We will introduce her to small dogs at a later date.